James is a Professor at the University of Queensland and Director of Science and Research Initiative at the Wildlife Conservation Society. Before moving to the Science Initiative, James directed WCS’s climate change program, leading the planning and implementation of climate adaptation and REDD+ projects throughout WCS’s landscape, seascape, and species conservation programs. He currently serves on the leadership committee for the Science for Nature and People (SNAP) Initiative, the International Panel for Biodiversity and Ecosystem Services (IPBES) Data and Knowledge Task Force, and was chair of the IUCN’s climate change specialist group. James is the Director the Green Fire Science research group (www.greenfirescience.com) whose mission is to do applied research that is linked directly to the practice of conservation. James is a graduate of the Australian Defence Force Academy and Royal Military College. 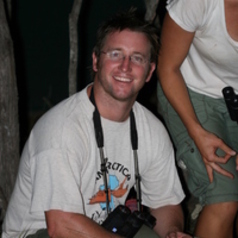 He completed his doctorate at the Oxford University in 2004, where funded by a Rhodes Scholarship he explored the effects of habitat fragmentation on birds in Madagascar and Australia. Since then, he has worked as a post doctoral fellow at the University of California (San Diego) and the University of Queensland and as a senior campaigner for The Wilderness Society in Australia. Founded in 1895, the WCS has the clear mission to save wildlife and wild places across the globe. Its story began in the early 1900s when it successfully helped the American bison recover on the Western Plains. Today, it protects many of the world’s iconic creatures, including gorillas in the Congo, tigers in India, wolverines in the Yellowstone Rockies, and ocean giants. Since its founding, WCS has forged the power of its global conservation work and the management of its five parks in New York City to create the world’s most comprehensive conservation organization. It currently manages about 500 conservation projects in more than 60 countries, and educates millions of visitors at five institutions in New York City: the Bronx Zoo, New York Aquarium, Central Park Zoo, Prospect Park Zoo and Queens Zoo.